Aston Villa will meet Arsenal in the FA Cup final after a thoroughly deserved win over a desperately disappointing Liverpool at Wembley. Villa’s win was a triumph for manager Tim Sherwood as his side produced a performance of style, composure and grit to come from behind and reach their first FA Cup final since their loss to Chelsea in 2000. As a consequence there will be no dream finale to his Liverpool career for Steven Gerrard. The Reds skipper, who will join Major League Soccer side LA Galaxy in the summer, was hoping to make a final appearance for the club in an FA Cup final scheduled to take place on 30 May, his 35th birthday. Philippe Coutinho clipped Liverpool into the lead but the dangerous Christian Benteke levelled before half-time and Villa scored the winner their display fully merited through Fabian Delph’s cool finish nine minutes after the break. Lethargic Liverpool mounted a rally of sorts late on when Kieran Richardson cleared off the line from Liverpool captain Gerrard and half-time substitute Mario Balotelli was dubiously ruled offside when he had the ball in the net. Villa, however, were not to be denied and the final whistle sparked scenes of joy among players and supporters alike. The normally animated Sherwood had been calm on the touchline throughout but all his emotions poured out as he celebrated another trip to Wembley on 30 May, on top of moving Villa towards Premier League safety. The ex-Spurs manager, who replaced sacked Paul Lambert in February, has overseen a superb rejuvenation at Villa Park. Villa had giants all over the pitch, particularly in the shape of Benteke and the gifted 19-year-old Jack Grealish, who played with a calm that belied his years in this hothouse atmosphere. Liverpool, in contrast, were dismal and once again failed to deliver when the big occasion demanded – which will be a matter of great concern to manager Brendan Rodgers. Aston Villa remain in relegation trouble as Bafetimbi Gomis’s late goal gave Swansea a dramatic victory. The French striker had earlier had two shots saved by home goalkeeper Brad Guzan, while team-mate Wayne Routledge had a shot cleared off the goalline. Gomis then scored with only three minutes left when he held off Ciaran Clark to convert from 12 yards after Jefferson Montero’s flicked pass. Fabian Delph’s first goal in a year helped fire Aston Villa to Wembley as they beat West Brom 2-0 to reach the FA Cup semifinals. The stand-in skipper scored for the first time since March 2014 as Villa became the first side to bank a last four spot. Scott Sinclair grabbed a late second after Claudio Yacob was controversially sent off with 10 minutes left and Villa substitute Jack Grealish was also dismissed in stoppage time, picking up a second yellow card for diving. But the win was marred by ugly scenes which saw seats thrown from the West Brom fans towards the Villa supporters. Victory completed a dream double over the Baggies after Villa’s 2-1 Barclays Premier League win on Tuesday, which lifted them out of the relegation zone. Christian Benteke, who scored the late penalty winner on Tuesday, was sidelined with a hip injury as Sinclair replaced him. Shay Given and Leandro Bacuna also came in while Boaz Myhill replaced Ben Foster in the Baggies goal, after the keeper’s nightmare game in mid-week, and Jonas Olsson started with Darren Fletcher cup-tied. Given had already saved from Berahino before Villa survived a huge let-off thanks to Brown Ideye’s wayward finishing after eight minutes. Craig Gardner wriggled behind the hosts’ defence and presented the ball on a plate for Ideye but the unmarked striker could only fire over from eight yards. It was the best chance of a poor first half which failed to live up to the pre-match hype. Villa lacked punch and a focal point without Benteke, failing to threaten during a first half where Gabby Agbonlahor struggled to replicate the performance which caused the Baggies problems in mid-week. There was no fluidity to the hosts’ play, allowing Albion to nullify them with ease. The visitors continued to be the aggressors and Given claimed Ideye’s header before he turned Brunt’s volley over after the ball had struck Olsson on the shoulder. 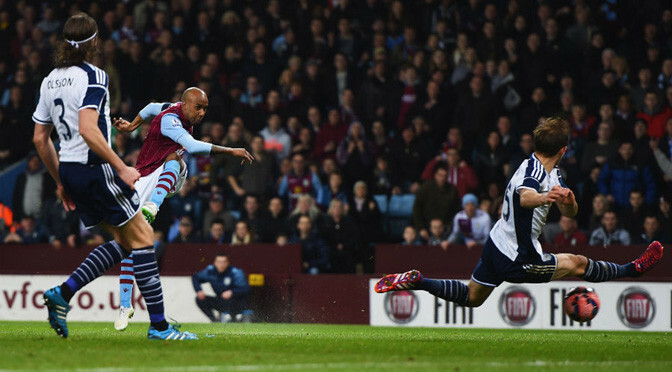 The Baggies were on top but Villa emerged for the second half with renewed purpose and took the lead on 51 minutes. The previously quiet Charles N’Zogbia skipped inside and found the unmarked Delph who was gifted too much time to rifle past Myhill from 16-yards. It was the midfielder’s first goal since he scored in Villa’s 1-0 win over Chelsea last season. It was also Villa’s first clear chance but Albion rallied and should have levelled six minutes later only for Joleon Lescott to plant a five-yard header wide. The goal had given the hosts renewed confidence, though, and Myhill had to rush out and block from Sinclair with 21 minutes left. And 90 seconds later the winger almost finished the game when he skipped down the left and dragged a shot wide. Albion were on the ropes and Ashley Westwood’s drive deflected wide before Gardner deflected the ball onto his own bar with 14 minutes left. It then got worse for the Baggies when Yacob was sent off for a second yellow card. There seemed little wrong when Bacuna went to tackle the midfielder, who remained on his feet, only for referee Anthony Taylor to issued a second booking for the Albion man. It left the Baggies fuming and Villa wrapped the game up with five minutes remaining when Grealish broke, found Sinclair and the Manchester City loanee cut inside Brunt and curled into the corner. Seats were then thrown from the Albion end into the Villa fans. Grealish was dismissed for a dive in injury time and game was also delayed after a pitch invasion from the home supporters before the final whistle. 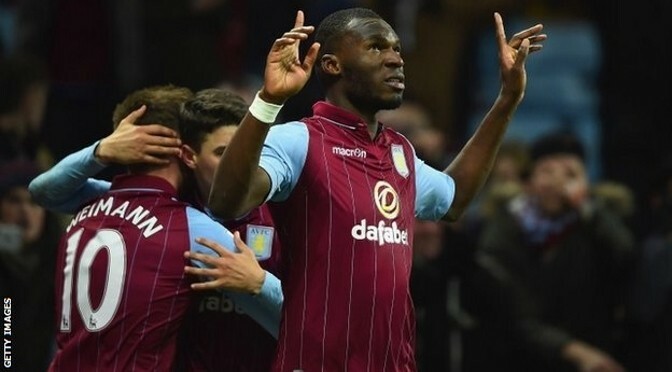 Christian Benteke scored from the penalty spot deep into injury time to give Tim Sherwood his first win as Aston Villa manager and lift them out of the Premier League relegation zone. Saido Berahino’s 18th goal of the season looked to have extended Villa’s run without victory to 13 league games after he equalised Gabriel Agbonlahor’s first-half goal. But with only seconds remaining, West Brom keeper Ben Foster capped a performance riddled with uncertainty by fumbling a clearance then rushing out to bring down Matthew Lowton. Benteke kept his cool to slide in the spot-kick in front an ecstatic Holte End to give Villa three points for the first time since 7 December. Sherwood celebrated wildly with his backroom staff as the first of the six wins he says Villa need to stay up was secured – thanks in large part to Foster’s poor handling and a rush of blood with the game almost over. The former England midfielder will have been delighted by a vibrant first-half performance that was an example of the “front foot football” he is demanding, but Villa went off the boil after the break and needed that dramatic conclusion to get the win. Sherwood will hope it not only provides the momentum required in the run-in but also a psychological lift ahead of the FA Cup quarter-final between these two teams at Villa Park on Saturday. Albion’s in-form attacking partnership of Brown Ideye and Berahino were declared fit – but were virtual spectators and starved of supply as Villa dominated the first half. In contrast, Villa used the pace of Agbonlahor and the power of Benteke to great effect, the pair combining as they took a lead they fully deserved after 22 minutes. Benteke flicked on keeper Brad Guzan’s clearance for Agbonlahor to outpace Joleon Lescott and roll a finish under Foster. Agbonlahor thought he had put Villa ahead earlier when Foster fumbled a routine shot, but goal-line technology confirmed West Brom’s keeper had scrambled back just in time to grab the ball as it rolled towards goal. And Foster needed the help of Lescott to salvage another desperate situation when the defender raced back to clear off the line after Albion’s defence had again been exposed by the pace of Agbonlahor. Villa’s only frustration was that they had failed to increase their lead and they were denied by the woodwork in first-half stoppage time when Delph’s precise shot from 20 yards bounced off the outside of the post to safety. It was safe to assume manager Tony Pulis would have had harsh words with his players after a dreadful first-half performance and they were almost on terms early in the second half when Craig Dawson should have done better than miss the target from seven yards after meeting Chris Brunt’s perfect free-kick. Villa did not heed the warning signs and another super delivery from Brunt yielded the equaliser in the 66th minute, his dangerous corner being met at the far post by Lescott and Berahino reacting instinctively in a packed six-yard box to head past Guzan. Tim Sherwood saw his new Aston Villa side edge into the FA Cup quarterfinals with a 2-1 win over Leicester at Villa Park. Sherwood had a watching brief but after a goalless opening 45 minutes, his half-time team-talk seemed to galvanise Villa and goals from Leandro Bacuna and Scott Sinclair settled a scrappy game. Andrej Kramaric netted an injury-time consolation for the Foxes but they could not force a replay. First-team coach Scott Marshall took charge of Villa after ex-Tottenham boss Sherwood was appointed as Paul Lambert’s successor on Saturday. Marcin Wasilewski hit the post for Leicester and Shay Given denied Matty James while Christian Benteke and Andi Weimann had goals ruled out for offside for the hosts. But Villa reached the last eight for the first time since 2010 despite their late scare. Benteke, Bacuna, Ron Vlaar, Tom Cleverley and Given all returned for Villa while Leicester replaced the cup-tied Robert Huth with Wasilewski. Foxes boss Nigel Pearson was also in the stands and would have been worried by the Foxes’ slow start. Eager to impress, Villa opened well and Weimann blazed over from 16 yards but their attacking threat waned, showing Sherwood the immediate problem he needs to fix. While there was plenty of endeavour the hosts lacked quality with Benteke isolated and unable to seriously trouble the Foxes defence. It gave Leicester encouragement and Wasilewski glanced James’ corner across goal and onto the face of the far post after 12 minutes. Slowly, the Foxes began to assert themselves and Kramaric went down under pressure from Vlaar before Wes Morgan headed over. Leicester were on top and Villa needed Given to roll back the years after 31 minutes to deny James. Jeff Schlupp’s pass was dummied by Esteban Cambiasso for James to arrow a shot towards the top corner, only for Given to produce a wonderful fingertip save. Villa did not need another warning and thought they were ahead a minute before the break when Benteke swept into the corner, but his strike was ruled out for offside. Seemingly buoyed by Sherwood’s half-time words, the hosts began the second half well and Fabian Delph’s mis-hit header flew over before Mark Schwarzer saved at Benteke’s feet after Vlaar’s header caught out the Leicester defence. The Foxes looked ragged and Benteke headed wide before Villa finally made their dominance count after 68 minutes. Vlaar slipped a cute ball through to Bacuna and the midfielder cut inside to unleash a curling effort into the bottom corner from 18 yards. Two minutes later Weimann had the ball in the net, only to be pulled up for offside, and Benteke fired over after outpacing Matthew Upson. A dour game had come to life and Leicester almost hit back when Kramaric failed to force the ball in after Given had spilled a cross. Vlaar then denied Riyad Mahrez with a last-ditch tackle and Kramaric headed over. But Villa made it 2-0 in the 89th minute when substitute Sinclair wriggled free. His weak shot was straight at Schwarzer but the keeper spilled it into his own net. Leicester immediately hit back in stoppage time when Kramaric headed in Schlupp’s cross but Villa held on. 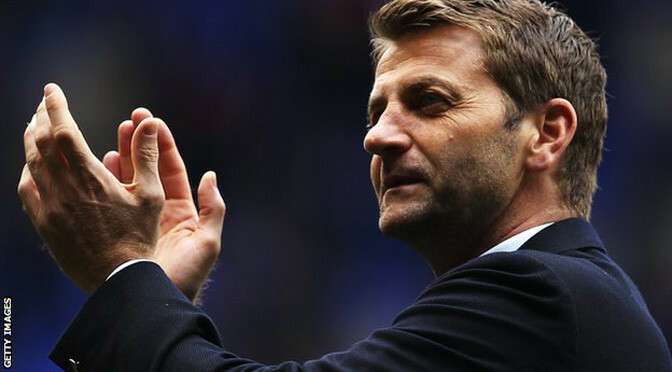 Tim Sherwood has been appointed manager at Aston Villa, signing a contract at the club until summer 2018. 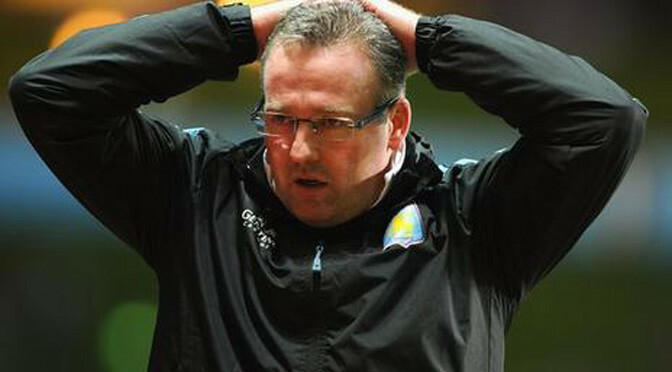 Villa sacked Paul Lambert on Wednesday after a winless run of 10 league games in which they scored just two goals. Sherwood, 46, replaced Andre Villas-Boas as Tottenham manager in December 2013 but was sacked at the end of last season and has been out of work since. “It is a great honour to manage one of the biggest clubs in English football,” said Sherwood. Sherwood takes over a Villa side that have struggled badly since taking 10 points from their first four matches – scoring just 12 league goals in 25 games, the lowest in Premier League history at that stage. They dropped into the relegation zone after Tuesday’s 2-0 defeat to Hull. The appointment comes just two days after first-team coach Scott Marshall and goalkeeping coach Andy Marshall took temporary charge following Lambert’s dismissal. Sherwood has been linked with a number of jobs since leaving Spurs, most recently the QPR post, when he looked set to be named as Harry Redknapp’s successor. However, negotiations with the ex-Tottenham boss ended after he sought assurances about the club’s future. Aston Villa chief executive Tom Fox said: “Tim had a fantastic career at Tottenham, not only in his brief spell as first-team manager but, just as importantly, in the role he played in developing young talent. After working as a coach at White Hart Lane from 2008, Sherwood stabilised Spurs following the exit of Villas Boas, taking them above Manchester United to finish sixth in the Premier League in 2013-14. Villa chairman Randy Lerner says he is convinced that the “fresh, positive approach” of Sherwood will be “very good for the club”. It is not known at this stage whether the new boss will be in the dugout for Villa’s FA Cup fifth-round tie at home to Leicester tomorrow. Sherwood, who won three England caps, joined Tottenham as a player in 1999 from Blackburn, where he captained them to the Premier League title in 1994-95. He left White Hart Lane in 2003 and moved to Portsmouth but returned as part of the club’s coaching staff under then manager Harry Redknapp. Aston Villa have sacked manager Paul Lambert after dropping into the Premier League relegation zone. Tuesday’s 2-0 loss to fellow strugglers Hull City was the West Midlands club’s 10th league game without a win. They have also managed just 12 league goals from 25 games – the lowest in Premier League history. Football pundit Pat Nevin said the sacking had been coming given Villa’s precarious league position, the lack of goals and the lack of entertaining football for Villa fans at home. Disgruntled Villa fans had called for the 45-year-old Lambert, who was appointed in 2012, to go during the game against Hull. Villa’s decision to sack Lambert came just hours after the Birmingham Mail started a campaign to oust the former Norwich boss. It was accompanied by the hashtag #lambertout. Birmingham Mail editor Marc Reeves told BBC Midlands Today that his newspaper wanted to give “hundreds and thousands” of Villa fans the opportunity to have their say on Lambert. “It’s a voice that needs to be listened to and the Mail wanted to play its part in amplifying that voice to the Aston Villa board,” he said. 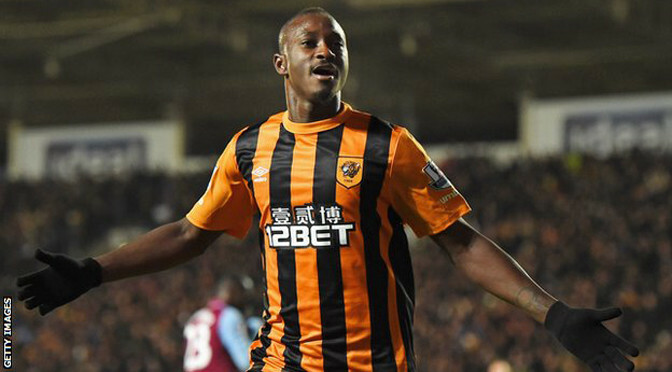 Striker Dame N’Doye marked his first start for Hull with a goal and an assist as they moved above Aston Villa in the table. Nikica Jelavic scored a deflected opener from N’Doye’s through ball. The Senegal international made it 2-0 with a close-range finish after Brad Guzan saved his initial effort following Gaston Ramirez’s header down. Victory lifted Hull to 15th in the Premier League table and left Villa in the bottom three. Paul Lambert’s Villa have now gone 10 Premier League matches without a win, they have not scored an away goal in almost eight and a half hours, and a banner reading ‘Lambert Out’ was unfurled by some visiting supporters at half-time. The lively N’Doye, a £3m signing from Lokomotiv Moscow on transfer deadline day, opened the scoring despite Villa enjoying plenty of early possession. and found Jelavic, whose shot looped off Villa defender Ciaran Clark and over goalkeeper Guzan for his seventh goal of the season. Hull, who had won only twice at home in the league this season before this game, gained confidence from the goal and N’Doye should have made it 2-0 when he headed wide from Ahmed Elmohamady’s clipped cross. Although Hull defender Alex Bruce was required to block Aly Cissokho’s second-half shot following an exchange of passes with Gabriel Agbonlahor, the hosts remained a threat on the counter-attack. Substitute Ramirez nodded down Elmohamady’s cross to find N’Doye, who scored from inside the six-yard box at the second attempt. Hull could have added to their tally in stoppage time when substitute Abel Hernandez chose to shoot from 20 yards when passing to a team-mate looked a better option. The closest Villa came to ending their goal drought away from home was when Hull keeper McGregor pushed away Ashley Westwood’s 25-yard drive and then kept out substitute Christian Benteke’s follow-up. Chelsea extended their lead at the top of the table to seven points after seeing off an Aston Villa team who finally ended their Premier League goal drought after 11 hours. With nearest rivals Manchester City held at home by Hull, Branislav Ivanovic’s winner secured a vital victory for the leaders. Villa, who had not scored in the league since 20 December, responded well after falling behind to Eden Hazard’s early goal and levelled through Jores Okore’s header at the start of the second half. But Ivanovic restored the Blues’ advantage after 66 minutes and they went on to secure Jose Mourinho’s first win at Villa Park at the sixth attempt. The spirit Villa showed in defeat will be scant consolation for Paul Lambert’s struggling side, whose winless run now stands at nine league games, but it appeared they were heading for a far worse defeat when Hazard opened the scoring after eight minutes. That goal was scored far too easily from Villa’s point of view, with their defence being carved apart as Oscar escaped down the right and fed Willian, who found Hazard running into the area to slot home. Villa’s main tactic in Lambert’s 100th league game in charge seemed to be to fire a succession of crosses into the box, despite that fact their out-of-form target man Christian Benteke was dropped to the bench and Gabriel Agbonlahor did not offer much of an aerial threat in his place. Blues keeper Thibaut Courtois gave them hope when he flapped at a couple of deliveries but Chelsea remained comfortable and even created further chances to extend their lead. That all changed after half-time, when Villa finally found a way to hurt Mourinho’s men. Carles Gil had already shown some neat touches before slipping past Oscar on the by-line and lifting in a perfect pass for Okore to power home a downward header. The goal brought wild celebrations from Villa’s players and fans – with Okore booked for running into a crowd, who had not seen a league goal from their side since 20 December. Ironic chants of “we score when we want” followed from the home supporters and with Chelsea pegged back in their own half, for a few minutes it least, it appeared more might follow. Not for the first time this season, the Blues found themselves in a battle, but they responded in perfect fashion. Mourinho’s men held firm at the back and began to build their own spell of pressure. Willian sent two shots skidding narrowly wide but the waves of Chelsea attacks were becoming relentless. Villa cracked after 66 minutes, when they failed to deal with Cesar Azpilicueta’s run and cross into the area. The ball broke for Ivanovic on the edge of the box, who fizzed an unstoppable first-time shot into the top corner.